Richard’s continuous research helps him to offer up the latest student support information. Presented through easy to understand techniques that help teachers recognize the importance of standing firm and tame aggressive behavior, while teaching and reinforcing pro-social and positive behavior skills. Attendees will discover the importance of a positive school climate, clear limits and consequences, parent and community partnerships and how to create a safe and supportive academic environment. Richard Paul’s Eliminate the Bullying teacher in-service session is an educational, interactive workshop that includes a power point, real life success stories, ventriloquism and valuable strategies to prevent and reduces school bullying, cyber bullying and aggressive student behavior. Richard mixes his humorous lecturing style with group-energizing activities that are cleverly designed to promote audience interaction, brainstorming. This assists with the creation of a school wide, bully prevention teacher, staff, parent, student support team. Workshop Goal: To offer up effective school team strategies that help identify bullying and the tools which one can implement to prevent, confront and defuse negative behavior. Projected Outcome: Attendees learn what bullying is and how it creates an unhealthy environment. They also learn to work together as a team to be proactive when it comes to reporting and implementing the right policies and actions to eliminate this aggressive behavior. Handouts: Client will be given master copies of handouts, evaluation and resource materials for them to copy and distribute the day of the event. 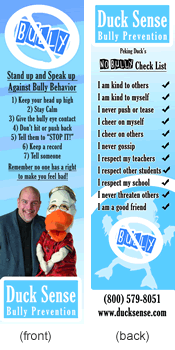 Also available for additional cost Richard's new Duck Sense Bully Preventions Curriculum, seven lessons for teacher to share in the classroom to promote discussion and positive behavior skills. As an additional option to this program Richard can set up a district wide webinar or pod cast that would be made available to both teachers and parents. Note: Remember Richard's also offer anti-bullying and positive behavior support kick off programs.